Our NCIS review broke down "Damned If You Do," this week's season finale, in detail. Join in as we analyze this season-ending, entertaining hour of TV's #1 show! 2. What was your favorite quote or scene from "Damned If You Do?" Doug: I actually laughed out loud when Franks started shooting the fish. The grin on Gibbs' face was pretty cool to see too. Christine: Admiral AJ Chegwidden! As a fan of JAG, the show NCIS spun off from, I was positively giddy when he walked in as Gibbs attorney. These two are kindred spirits. Heck, "AJ" even stands for Albert Jethro! I really hope we get to see more of him next season. Steve: The JAG callback was great. I also enjoyed the log cabin scenes (was that what he was building throughout NCIS Season 10?) and Gibbs torching Mike's files - another callback to years past. Oh, and Delilah?! 3. What was the most frustrating unanswered question? Doug: How the heck does an irradiated severed head, the NCIS troubles with Parsons, and the death of Kazmi all relate to each other? When Tom Morrow gave his explanation to Vance, and Vance nodded as if he understood, all I could think was "the operation was a success; the patient died." Christine: There were so many, some of which Doug covered but for me it was what happens to Tony, Ziva, and Tim. They said they admitted to their own actions. Will Parsons file charges against them even though they've quit? And even if he didn't, what's next and how do we get them back? Steve: How does the severed head tie into the case? And how can Ziva, Tim and Tony admit responsibility and resign, then still get their jobs back down the line? 4. What should Jimmy and Breena name their baby? Doug: Jimmy has so much love and respect for his mentor that I can see him wanting to name his child Donald. If it's a girl he might want to name her after his mother Eunice. Christine: Doug took my only thought. I know they're adopting but can't you just picture a little Jimmy running around with glasses? He'll make a sweet father. 5. Tony and Ziva: Forever in the friend zone? Doug: Certainly seems that way doesn't it? That horrific kiss on the forehead from Tony to Ziva would certainly seems to seal the deal. Expect a lot of hints and innuendo in this coming year. World's worst foreplay. Christine: Seriously, if I never hear the word Tiva again I would be very happy. What a waste. As a fan of these two characters I feel completely jerked around. Once again the show teased a payoff for this couple and then never followed through. I wish they'd just give them both steady outside love interest and be done with it. Steve: Maybe naively, I thought they were going to kiss for real there at the end. Then Tony got friend zoned, and I think that window closed. I don't know what lies ahead in NCIS Season 11, but this felt like a turning point to me, and maybe it's for the best. 6. The plot to thwart Parsons: Satisfying or underwhelming? Doug: Underwhelming. Convenient. Almost lazy. But for all of that - its redemption lies in the fact that it's incomplete: Gibbs is not off of the hook. The investigation into his behavior is postponed, not cancelled. I think that's a good thing too: I want to see the irritating sleaze artist come back to gnaw at the team's underparts in the next season. Christine: Eh. Kind of underwhelming considering all of the build up. It felt like there should have been more to the fight. Steve: It was a little of both. Underwhelming for the reasons Doug and Christine said, but satisfying in that it wasn't an easy out. Parsons wasn't undone by a hidden skeleton, and lived to fight another day. He caused the resignation of three NCIS agents, and it took a major hierarchical effort to get Gibbs out of this one - and he isn't even out of it yet. No one can say there weren't consequences or that this scandal was swept under the rug. 7. Where is Gibbs and what is he up to? Doug: Many have suggested that he didn't shoot Tobias. I'm open to the possibility that he did. My guess is that there's a rabid mole within the alphabet soup hierarchy of the various services, and maybe Tobias is one of them. When Tom Morrow ruled out Iran and North Korea, all we were left with was home-grown terrorists or (worse) internal spies. My guess is that someone from high up has recognized his unique black op skills and wanted him to clean up the mess. As for where - I think he's on home soil. Christine: I'm assuming he shot whoever Tobias was protecting, whomever stepped out of that car. To what end is anyone's guess. Steve: If the implication was that the CIA took out Kazmi to cause international hysteria and allow the U.S to focus on the real threat, so to speak, then that could well be a mole hunt. Something that would definitely qualify as a black ops mission for Gibbs. He did not look surprised to see Fornell in the crosshairs, yet he did hestitate before taking what would have been a clear shot. 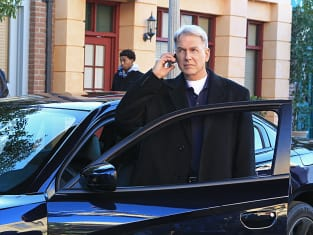 If Tobias isn't the target, is he working with Gibbs or in the dark about the fate that awaits whomever is in the car with him? And who is the injured man with Gibbs?! So many questions. 8. There have now been 10 NCIS season finales! Which was your favorite and why? Doug: So far, I think the NCIS Season 9 finale was the best. Having someone bomb the NCIS building while Ducky had a heart attack on the beach certainly seems to trump any of the other seasons for me. Fans scrambled to see if David McCallum's contract was renewed. And we got to see Ziva and Tony trapped in an elevator - making the fans wonder once again just what activity they would have to do to keep themselves occupied until help arrived. The writers of NCIS are the absolute masters of The Big Tease. Christine: Nothing has ever beaten the Season 2 finale where Caitlin Todd was killed. It was so shocking and heartbreaking that it's always stood with me. Steve: Hard to argue with Christine. That one still gives you the chills today if you catch it on USA! But after seeing Mike Franks again this week, I couldn't help but recall his funeral in the NCIS Season 8 finale, when Gibbs' woodworking was unveiled on his coffin. That was pretty awesome.